St Guthlac was an ascetic hermit of Crowland in Lincolnshire. A cult quickly developed after his death in about AD714, with accounts of his life being written in both Latin and Old English. The Guthlac Roll is about 16cm wide and nearly 3m long, composed of several sheets of parchment attached end-to-end, on which are drawn a series of scenes of the life of his life in roundels. It has been suggested that they take this unusual form because they are designs for stained-glass windows. 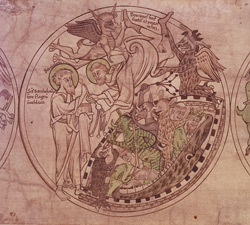 This scene shows St Bartolomew giving Guthlac a scourge (whip) with which to defend himself, just as he is being tormented and carried off by demons towards the mouth of hell.